New York, NY, February 8, 2017	(Newswire.com) - Touchstorm, LLC announced today the release of the first-ever music ranking system for YouTube that enables fans, musicians, and the industry to see which songs and artists — both signed and unsigned — are climbing the charts. 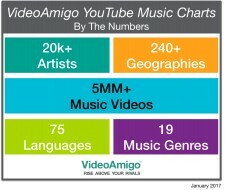 The weekly YouTube music charts are free on VideoAmigo.com and report on 19 different music genres in 240+ geographies and 75 languages. "Yesterday, musicians built their fan bases by gigging. Today, they do it on YouTube," said Alison Provost, CEO of Touchstorm and VideoAmigo. "Our tool measures and reports on everyone from cover artists to cello players to Grammy winners, and enables up-and-coming musicians to prove that they are succeeding. This is a first for the industry." Artists like Justin Beiber, Karmin, Lindsey Sterling, Tori Kelly, The Weeknd, and Pentatonix were first recognized on YouTube. However, Billboard's YouTube chart only tracks the top 25 songs for any given week, inevitably highlighting only the most famous musicians and the occasional surprise viral hit. And YouTube's own artist chart only reports the top 100 songs. Neither platform offers genre, language, or country for YouTube. The result is an industry-wide challenge where artists outside of the top 100 struggle to quantify their success and A&R executives are faced with massive data to process to recognize artists as they rise. Currently, the music industry and fans are primarily informed by veteran chart-maker Billboard, which uses Nielsen-based radio airplay, retail sales, and unspecified "online streaming data" to report on the top songs and albums. When measuring that streaming data, Nielsen includes counts from Spotify and Pandora, for example, that serve up songs without a specific consumer request. VideoAmigo provides measurement based on what consumers are actively choosing to watch or listen to. This creates new insight into which music and artists are capturing growing fan support and passion. On any given genre chart, users can see every single song or artist, even if it ranks 10,001. 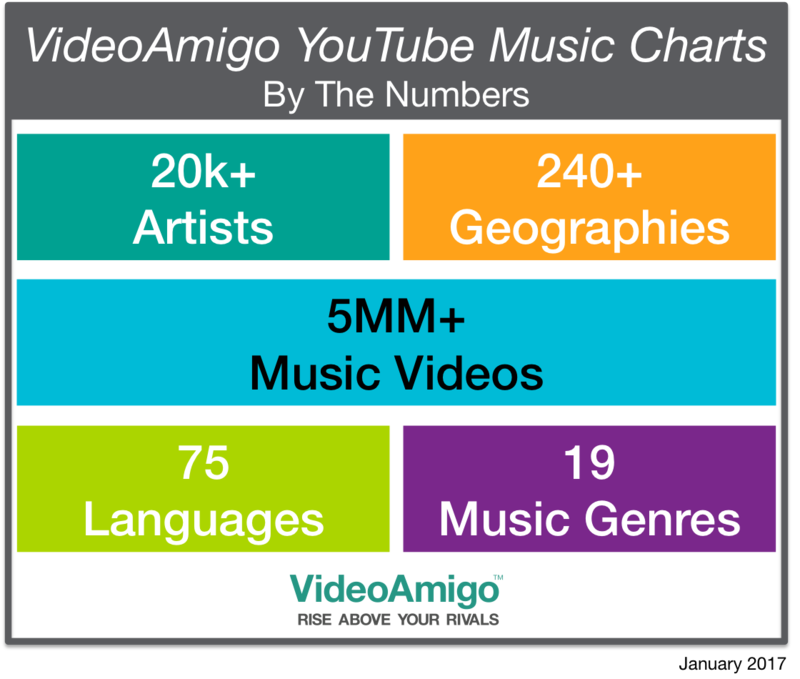 "VideoAmigo's weekly YouTube music charts are the closest you can get to identifying actual consumer demand for new music," Provost added. More than 20,000 artists from around the world are already in the system, and hundreds more are being signed up each week. Ajoy Thomas, Touchstorm's CTO revealed, "From a tech point of view, it's deceiving how much processing power it takes to look at every music video on YouTube and to capture all of that data daily. There are incredibly complex systems of tech behind this simple tool, including machine learning, that is now starting to help us classify songs by genre instead of doing it manually. Getting over those technical hurdles has enabled us to offer this obviously-needed tool." Staffed with a unique blend of marketers and technologists, Touchstorm and VideoAmigo are sister companies owned by Diginary Holdings LLC, headquartered in New York and Richmond, with global employees serving clients around the world in eight languages. Touchstorm (www.touchstorm.com) is a tech-enabled services company that builds social media audiences for the world's largest brands. Using strategic solutions rooted in data, Touchstorm manages YouTube channels for organic growth, creates and executes influencer-marketing campaigns, conducts Topic Finder research, produces social videos, and executes paid media. VideoAmigo (www.videoamigo.com) is a free self-serve social media analytics platform for creators and brands that helps users Rise Above Your Rivals™. Diginary Holdings LLC is self-funded and women-owned. Touchstorm is certified as a women's business enterprise by the Women's Business Enterprise National Council (WBENC). Company clients include Craftsman Tools, COVERGIRL, JCPenney, Pampers, YouTube, Gillette, Max Factor, Vineyard Vines, Clairol, Kenmore, and YETI.